I'm passionate about reading. I primarily read fiction and my favorites are mysteries (especially cozies), Christian and Amish fiction, and the occasional chick-lit. 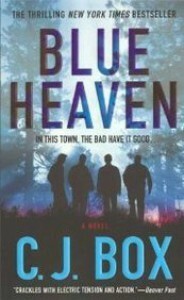 This was my first CJ Box novel and it won't be my last! This is a complex and gripping thriller that gets more tense with each page. I could hardly put it down. CJ Box writes a series about Joe Pickett, but this book is a stand alone. In this story,12-year-old Annie and 10-year-old William witness an execution in the woods and then have to go on the run from the executioners, who happen to be retired, crooked cops. It is hard to know where to turn or who they can trust, as the crooked cops infect local law enforcement. This story shifts POV quite often. As a parent it's harrowing to read stories about missing children, so I liked when the POV shifted back to the kids and I could see that they were still "okay" (I use that loosely, because how "okay" can one be when pursued by a group of killers). There are several subplots that converge in this story and in the beginning this can make it a bit slow and choppy. As you get very involved in the story the POV suddenly shifts and jolts you out. But the ties between the storylines become apparent and it quickly becomes addictive. The book lost one star for the ending, which I will not spoil. I will just say it felt a bit rushed and could have given better closure. I have seen other reviews comment on this as well, but clearly not everyone is bothered by it. This can happen all too often in these types of books, I've read more than one Sue Grafton novel that I couldn't put down just to get to the end and think, that's it? However, I still enjoyed the book a great deal and highly recommend it.